I love the Palau de la Música. It is ornate and gaudy and everything that was wonderful about modernism. 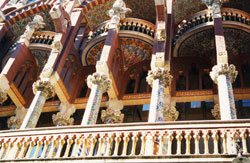 It's also the home of the Orfeò Català, where I learned the curative powers of Moscatell.